To make sustainable change and get people moving across the country, we need physical activity champions and advocates taking active roles in their communities. With our free resources, technical assistance and education around exercise and health, you can access the materials and evelop the skills to become a physical activity promoter and advocate for well-qualified exercise. This tookit contains information about the benefits of walking and provides guidance to create successful walking groups. There are two versions of the toolkit, one for fitness professionals and one for individuals and community organizations. These webinars cover topics in advocacy and policy that will help you grow your business and learn how to leverage your skills to make a change in your community. All webinars are free to view. Participants who purchase the recorded webinar after it has been posted may earn 0.1 continuing education hours. 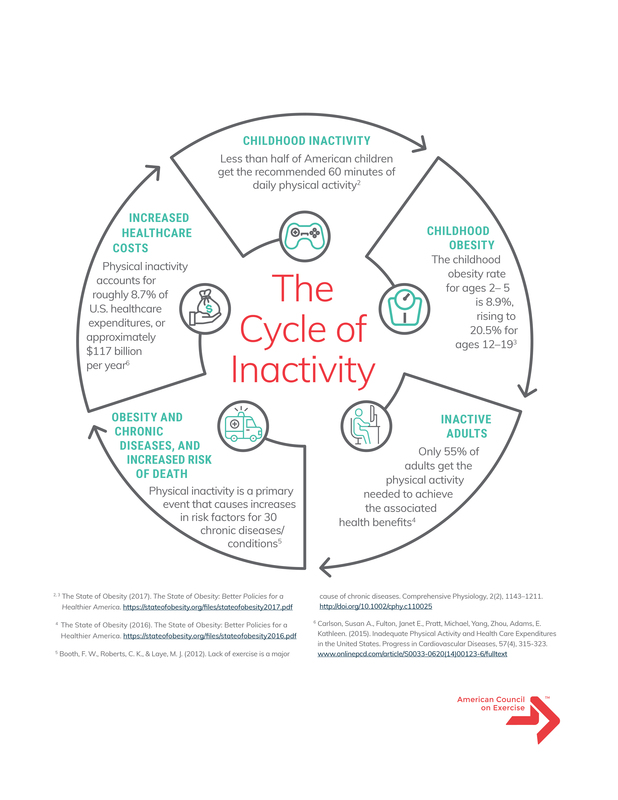 This graphic depicts the health and financial burdens that accompany sedentary behaviors through the lifespan. Our monthly e-newsletter is how you can stay connected to all currect accountments, latest news, updates and opportunities from our advocacy team.